Healthy Pasta Recipes, and pasta in general has gotten a bad rap over the years as being an unfriendly diet habit, because it’s full of the dreaded carbohydrates that we are all trying to avoid for weight control. Is the rap sheet such that you should be avoiding pasta at all costs, or is there a healthy way to include pasta into the mix? It’s Quick! Many pasta choices take only 3 minutes to boil, so it’s quicker to make a pasta meal at home than going out to fast food. It’s Easy! If you can boil water, you can prepare pasta. If you can open a jar, you can prepare the sauce. It’s a meal that anyone can prepare. You must be careful when pouring out the boiling water, but otherwise it’s simple. It’s Inexpensive! You can easily find pasta for 99 cents a pound, or even less on sale. It’s Versatile! 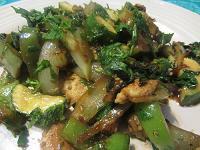 You can include it in main dish recipes, casseroles, salads, stir fries, chilies, and soups. It’s not Boring! 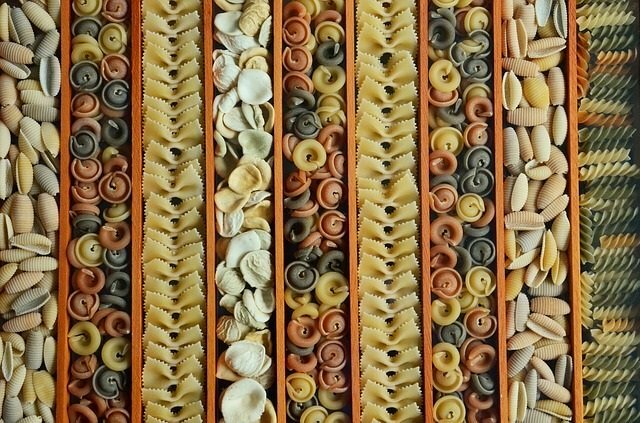 You can serve pasta every day for a year, and never make it the same, because it comes in all different shapes and sizes. It’s special diet friendly! 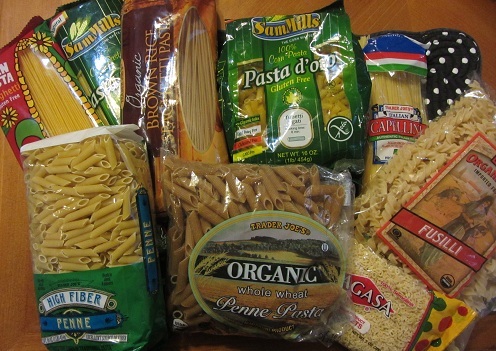 You could use brown rice, high fiber, spinach, sprouted wheat, corn, whole wheat, gluten free, or organic pasta, and many more varieties are available. 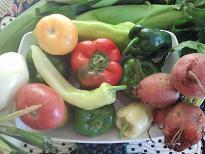 It allows you to include so many different seasonal vegetable choices into your meal rotation. Pasta Con: The one big con for pasta is portion size. 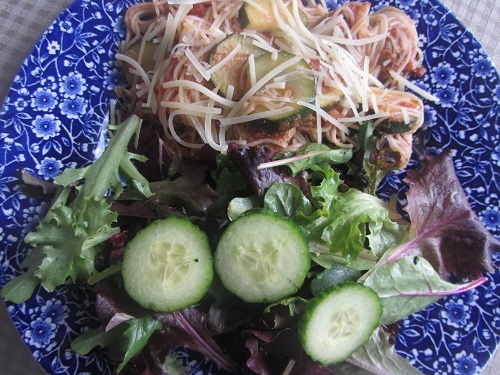 Pasta servings are enormous, and many times 3 or 4 portions. A portion of pasta is 1 cup and that is 200 calories. That huge pasta serving is not diet friendly, but some simple changes can allow you to add pasta back to your healthy meal plan rotation. Measure out 1 cup of cooked pasta only. 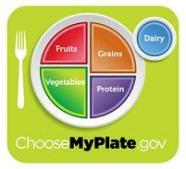 Follow the half plate rule that says 1/4 of your plate should be your carbohydrate choice. 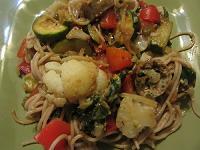 If you are serving pasta, 1/2 of your plate should be full of vegetables. 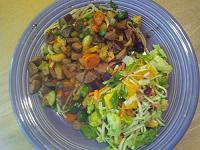 Include a salad that fills half of your plate, and vegetables in your spaghetti sauce. Avoid serving bread with pasta. Avoid cream sauces that are loaded with calories. 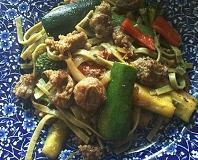 Add more vegetables to your existing pasta recipes. 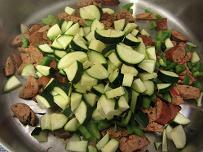 Vegetables should be at least half of pasta salad, casseroles, or main dish recipes. 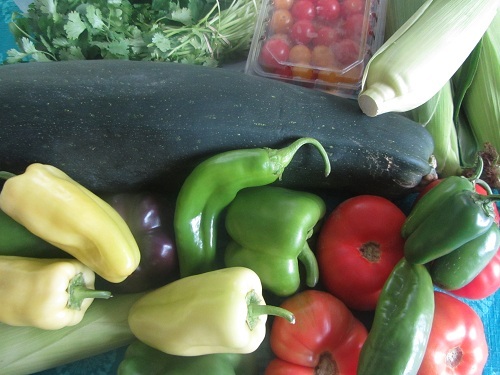 You will rarely find recipes that include that quantity of vegetables, but just double or triple the recipe additions for vegetables in your favorite recipes. Pasta recipes of the old days are gone. I would agree that a plate full of pasta topped with a canned red sauce is not going to cut it, but a cup of pasta topped with a red meat sauce that is loaded with vegetables, can be a very healthy addition to a healthy eating plan! A generic quick pasta recipe should be a welcome addition to your healthy recipes collection, especially if you are into seasonal cooking. 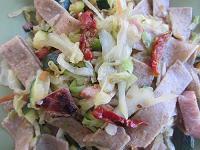 Many recipes can be developed from this recipe! 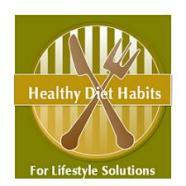 Healthy Spaghetti can be kept in a healthy meal plan! Tips and recipes to keep this beloved favorite in your diet! 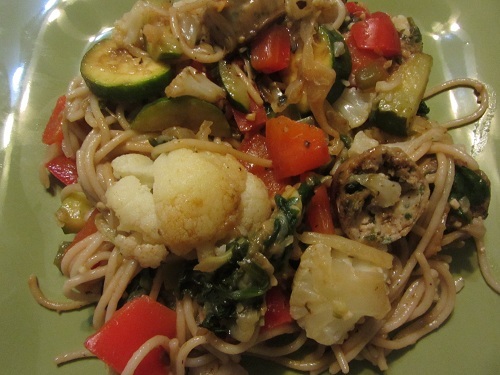 Fixing seasonal vegetable pasta is a healthy diet habit and a quick dinner meal idea when time is short. 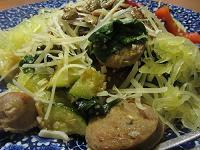 This recipe has spinach, cabbage, peppers, zucchini, and cauliflower! This spaghetti squash recipe will allow you to keep pasta meals in your diet when you want a low carbohydrate treat that does not weight you down with extra calories! 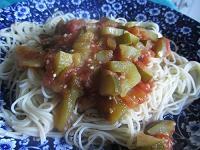 My Mom's vegetarian spaghetti recipe is not your traditional spaghetti recipe using red sauce and meat. 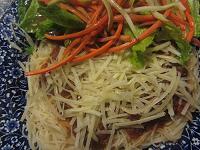 It's laden with vegetables and topped with Parmesan or Romano Cheese. 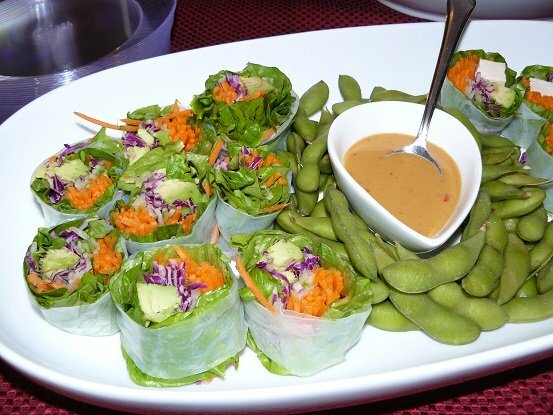 Meatless Monday Idea! 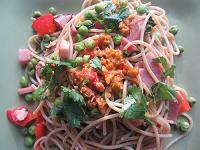 Vegetarian Spaghetti is a wonderful treat for the warmer weather when heavy meals aren't appealing. 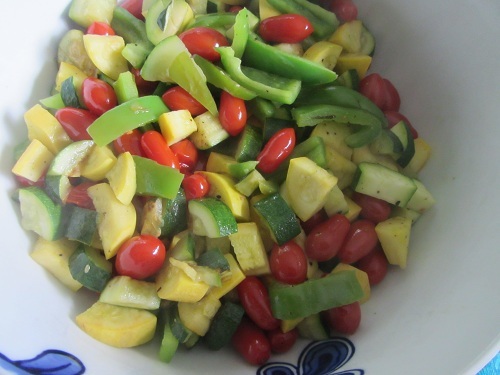 This recipe uses oven roasted bell peppers, zucchini, spinach, and fresh tomatoes!